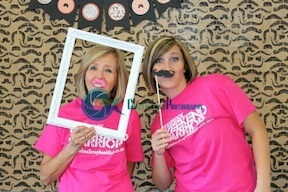 This is a mother-daughter team where we both share great joy in preserving our memories. There is no greater gift than to just look back and reminisce with all of your pictures laid out into a complete story. Getting away for an entire weekend, not only spending some one on one "girl time" together but scrapbooking at the same time just seemed heavenly. So we put our heads together & started a group. Little did we know that it would go this far. But with the determination and the late night emails going out to everyone, it became a yearly event that keeps on growing. We don't like to look at it as a business, we look at it as a getaway for ourselves as well ;)! We enjoy organizing weekend happenings for others as well as getting to know everyone that comes to an event..Its more a personal thing with the retreats- we stay small under 100 so we can get to know each of you, and we love it that way! We hope that you will find a scrapbook retreat location that you can be a part of. We look forward to having you an an upcoming retreat.